Just as the name implies, this is a top 100 of my personal favorite games of all time. Keep in mind that this list is my opinion and no-one else's, so if you don't agree with an included game or where it's placed... I honestly don't care! I've never been huge on dungeon crawlers, but Castle of the Winds was always one that appealed to me. 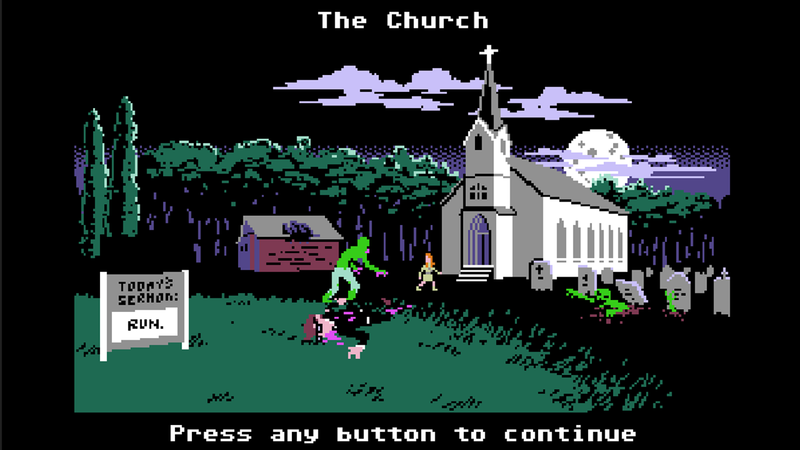 I think a large part of that may be nostalgia value for a simpler time in gaming; the crudely-styled non-animated sprites and graphics, the tiled Windows interface, the brief but very well-written bits of prose (most of which are in a .hlp file; how ancient is that? ), and of course hours of gameplay that its developer managed to cram onto a single 3 1/4" floppy disk. Even today, I can still load this one up in a VM and have fun for a few hours disarming traps and killing monsters with ice balls. Games like Diablo and Torchlight may be better in every way, but Castle of the Winds is an excellent guilty pleasure. The early days of arcade gaming brought us many classics; there's no doubt about that. But for my money, the game that holds up the best from this era is Space Invaders. 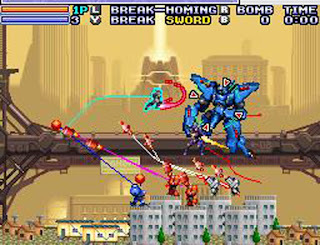 A predictable game in theory with its waves of enemies that grow progressively faster as their numbers thin, but it's deceptively tricky in practice; it's a fine art to selectively eliminate enemies, use your shields to defend enemy shots and time your shots to destroy the UFOs for maximum points. There's also a classic appeal in the minimal graphics and the moody sound design, with all of the action set to a "heartbeat" that gradually increases in tempo as the action heats up and conveys a sense of ever-rising tension throughout. Simple but extremely addictive and fun, Space Invaders is one for the ages. 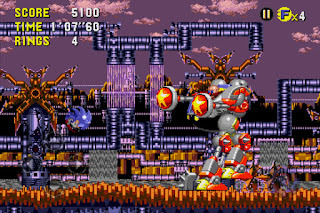 Sonic is something of a lightning rod in the gaming consciousness ; you either adore the franchise's fluid animation and fast paced gameplay or you just view the character as a dated relic of the 90s whose relevance has long since faded away. It's a little of both columns for me, as once his golden years on the Genesis faded his games have all been pretty mediocre and high on the cringe factor. However, I do still hold the 16-bit Sonics in high regard, and on that front, Sonic CD gets my vote for best of the bunch. Working a clever new gimmick into the mix (time travel!) 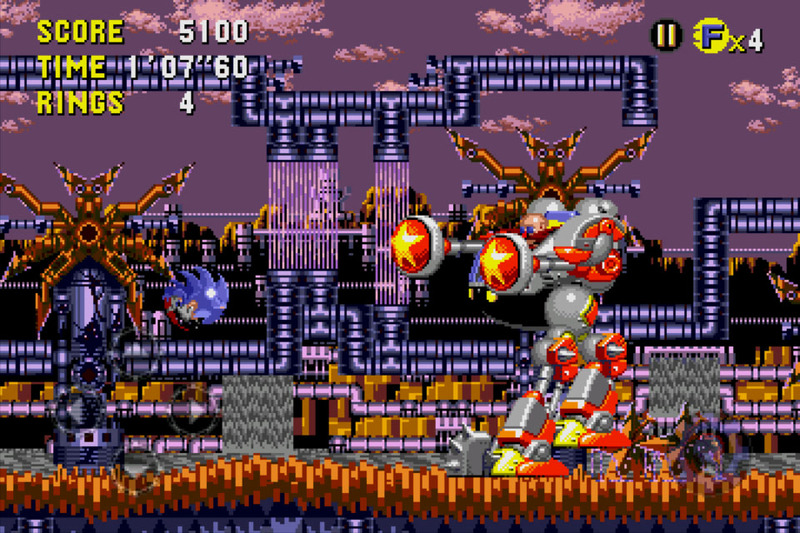 and creative puzzle-based bosses without disrupting the sense of speed, and having a top notch audio/visual presentation thanks to the CD hardware, Sonic CD is just a damn fun time. 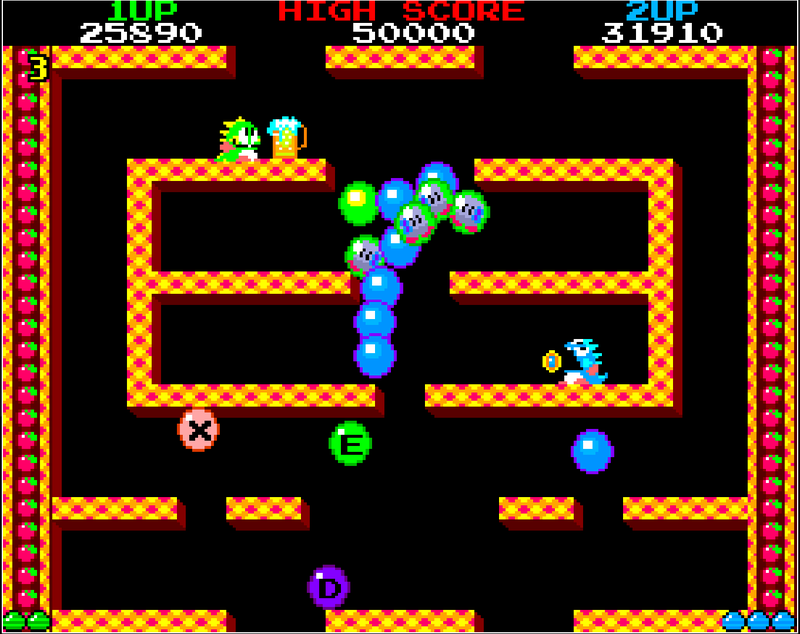 Games definitely had a weird sense of imagination to them in the 1980s that was unmatched by almost any other era, and that is perhaps nowhere more evident than in Bubble Bobble, an arcade game where you play as a dinosaur who traps his enemies in bubbles and pops them to turn them into fruits for bonus points. Racking up big enough scores in levels also allows you to collect a huge variety of powerups, from rapid fire bubbles to magic wands that call down lightning to speed shoes, which in turn allow you to get on a roll and rack up even higher scores at an incredible rate once you start getting them consistently. It's pure lunacy, but tremendous fun, especially in two-player co-op (which is also necessary to get the best ending in the game). Most of the home ports are surprisingly solid (the Sega Master System version being my favorite), but the arcade is definitely the best of all. Not a direct continuation of the Dreamcast cult classic, but nevertheless continuing in its tradition of wild, over-the-top action, Bangai-o Spirits takes things in the logical direction - more weapons, more enemy types, and tons and tons of explosions to the point where the Nintendo DS's hardware can't keep up a lot of the time (and frequently has to pause for a few seconds in order to parse the sheer number of objects being put into play). Regardless of that and its intense difficulty at times, Bangai-o Spirits is a blast, having the player clear out stages and - more importantly - design their own and distribute their challenges to other players, with no Nintendo Wi-Fi service required. Saints Row is a franchise that's undeniably gotten more and more ridiculous with each new sequel, slowly turning from a fairly straight GTA clone to a full-blown Tex Avery cartoon by the third game. But in an era where so many game studios and franchises take themselves so damned seriously, I don't think that's a bad thing at all. 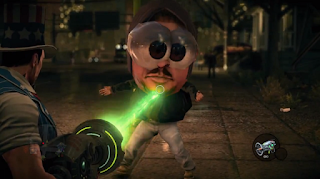 Saints Row IV in particular recognizes exactly what video games should be about - pure, campy fun. From the joke-heavy dialog and outlandish storyline to the ridiculous weaponry (featuring things like a Black Hole Gun and a Dubstep Gun) to a plethora of over-the-top superpowers and exaggerated enemies, as well as some rather amusing satire of other contemporary games, Saints Row IV is pure entertainment that never wears out its welcome. I honestly wish more games and developers had the courage to revel in their own silliness as much as Volition does. A rare example of a parody game done well, as well as an homage game that, while clearly based on another title, does a lot to distinguish itself from its inspiration. Case in point, while it is a clear parody of Oregon Trail and draws cues from many popular zombie films, it also manages to convey a grim mood and a tense atmosphere thanks to some stellar sound design and an overall high degree of challenge. The player is constantly on edge throughout, worried that anything can go wrong and leave them stuck (and it frequently will). The dark mood, paired with some clever minigames, branching paths and difficulty levels and numerous randomized events, ensure this is one roguelike I can start up anytime and have fun with. 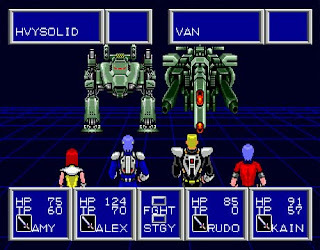 In an era where JRPGs mostly consisted of "the grind", Phantasy Star II dared to take things to a new level, introducing a grim atmosphere, themes of betrayal and hubris, and some surprisingly memorable characterizations to the mix, which only added to the tension as the story proceeded. Of course, there is still plenty of challenge along the way - enemies are numerous and dangerous, and dungeons are frequently large mazes of teleporters and walls that require a lot of patience to traverse, even with the included guidebook that provided maps of every one. There is still quite a bit of grinding required, but the compelling story and the streamlined combat system ensure that it never gets too tedious, as does it having one of my all-time favorite endings. A relatively overlooked Treasure title, but I can't blame people too much for that as its only western release was handled by Working Designs, who made some rather controversial changes to the mechanics in an effort to make the game "harder", with fans of the original release generally considering it a butchered port. Still, those who had a chance to play one of the Japanese versions (either the 2D powerhouse Saturn version or the Playstation version with some added content) found a lot to enjoy. 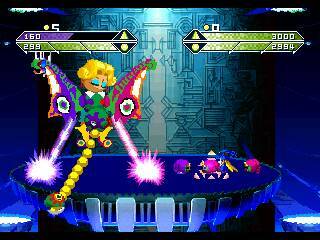 Treasure's unique blend of wild action, colorful visuals and crazy characters, as well as some interesting mechanics (with your character's "polarity" switching whenever they face the opposite direction, affecting what attacks they can block or must avoid) makes this an unconventional, but highly entertaining experience. I've never been a huge fan of shmups, but Tyrian 2000 is definitely an exception, providing challenging gameplay with plenty of pop. Drawing inspiration from the likes of R-Type and Zanac while introducing many elements of its own, Tyrian has a lot to offer. 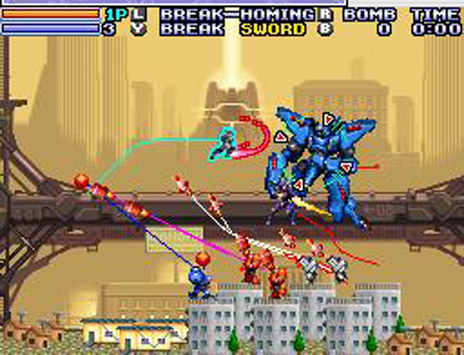 In addition to a story mode that has you collecting points to purchase ship upgrades, there are other clever game modes like an Arcade mode that lets you collect powerups and input Street Fighter style moves to do special attacks, minigames like "Destruct" (an artillery combat game similar to Scorched Earth or Worms), plenty of alternate paths and hidden content and a strong sense of humor. All in all, just a fun, kickass game for the PC platform; it's a pity Eclipse Software never made more games after this one.